Andres Uibomäe, and his business partner Kaarel Kivikangur, had a dream. A dream to build a motorcycle that would make an art gallery proud but rides like the best grand tourers out there. I (Lauri Poldre) had the chance to talk to Andres and ask him about his journey when working out this motorcycle design. Lauri: What is your background? Andres Uibomäe: I was educated as an industrial designer, but motorcycles have been my big passion for as long as I can remember. During my teen years, all I did was to ride and repair motorcycles. I have owned about 15 different motorcycles and modifications. I can’t even remember all my motorcycles; most of them were of Russian origin, though. Every time, it ended in the same way – rebuilding, modifying, tuning. So the background behind Renard is passion from one side, and a designer with creative ambition but no outlet. Somebody once said that four wheels move your body but two wheels move your soul. Lauri: When did you start with the Renard project? Andres Uibomäe: I stumbled upon Renard trails accidentally, seven years ago, when talking to a motorcycle restorer who had been investigating Renard history (Renard was a small Estonian motorcycle brand at the end of 1930s). Renard is a beautiful name, and I am happy that such an old motorcycle industry legacy is available for us to continue. Due to the Soviet occupation, most historic ties have been broken. If we had not restored the legacy, then most probably the next generation would not have remembered Renard any more. I hope that we are worthy of the name, and that the new company can last for longer than the old company lasted before WWII. The modern company, Renard Ltd, was established in June 2008. Kaarel Kivikangur (left) and Andres Uibomäe, engineers behind Renard. Photo by Jarek Jõepera. Lauri: Did you just want to design an awesome bike, or did you have any other goals too? Andres Uibomäe: For me, it was essential – in addition to a great design – that you are also able to have a good ride. 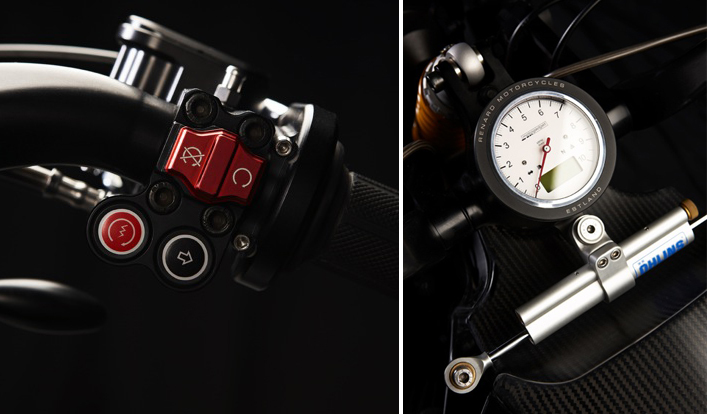 Lots of our partners and collaborators have expressed their opinion that there is no difference what engine or suspension you use, and that people will buy the motorcycle just for its design. I absolutely understand them, but it is not the right viewpoint in my opinion. For me, it is important how the motorcycle rides: the sense of control, dynamics, endurance, performance and other characteristics. Building moto-sculptures is not exactly my cup of tea. But our major underlying goal is to restore the Renard brand. Lauri: How different is the result from your original vision? 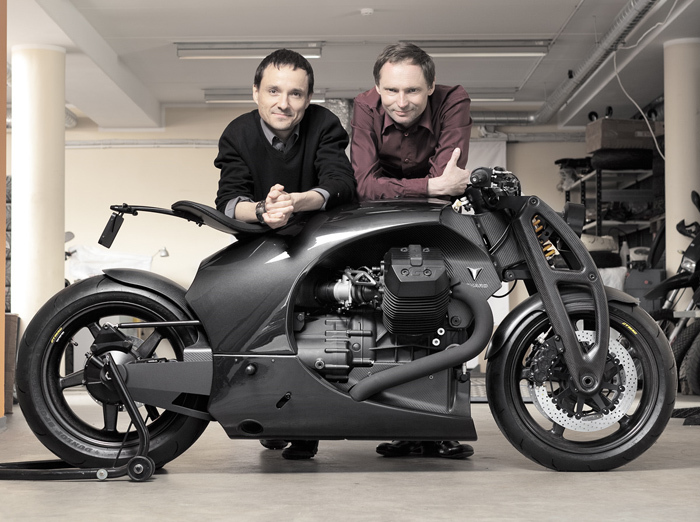 Andres Uibomäe: Since our initial idea was to build monocoque motorcycles, it has remained practically the same. Possibly it has changed in small details, but it is marginal. Renard. Photo by Kalle Veesaar. Lauri: How will the production model differ from the concept? Andres Uibomäe: We’ve developed both technical capabilities and also user friendliness for the motorcycle. The serial model is 15 kg lighter than the prototype. In some parts, steel has been replaced with titanium; CNC milled parts are lighter than in the prototype. In important hubs, we have improved technical solutions and durability. Everything that contributes to the identity and shape of Renard, we try to keep as clean as possible. New models must carry the same Renard visual characteristics and concepts as are exhibited by the current GT model. Lauri: What has been the response from the world? Andres Uibomäe: In terms of the design and shape of the motorcycle, it has been surprisingly positive. When it comes to brand and product, then it is too early to say; we still have to prove that we are a sustainable company. Everything else will follow. Lauri: Is the design original or were you looking at other brands and models for inspiration? Andres Uibomäe: I can’t say that motorcycles with outstanding designs haven’t played an important part in the birth of Renard, but engineering solutions are no less important for inspiration. The design is inspired by motorcycles from the middle of last century: for example, the 1949 Majorca Moto Major 350, 1953 Killinger and Freund, 1934 BMW R7 and 1949 IZH 350 (which is, incidentally, the motorcycle of my childhood). The Renard GT has been compared with the Confederate Wraith, but mainly through the similar design of the first wheel suspension, which also originated from the 30s of the last century, when a similar solution was used by a large proportion of manufacturers. 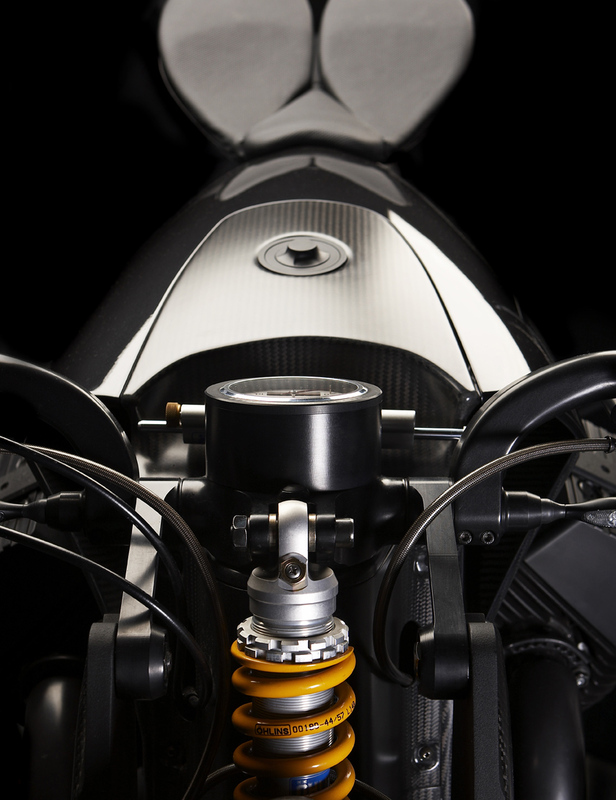 The Renard identity lies in its supporting body monocoque, which makes our motorcycle’s design unique and distinctive. The Renard GT combines classical but also somewhat retro lines, and presents a modern, simple and clear logical form through its ultramodern use of materials. The engineering was done by Ando Paapstel and myself; freehand forms were done by Siim West and Mait Mahlapuu. Lauri: What is it that makes Renard so special? Andres Uibomäe: In technological terms, the most special aspect is the supporting body; there’s nothing else like it in the whole world. This is underlined by the fact that when we started searcing for partners who would produce the body for serial production, we could not find any companies that were willing to do it. We received only three replies to fifteen enquiries! Lauri: What have you learned during this project? Andres Uibomäe: I’d say that the most important factor is the people with whom you form a team. A decent team and great teamwork makes things move. Lauri: What are the technical specifications? Lauri: What components are unique? Andres Uibomäe: I can’t say, really. I’d say instead that the assembly of the components is unique, in the combination of all the separate parts. Certainly, some parts are more compatible and work more successfully together, and some have gone wrong; but we get to know all this as we progress. 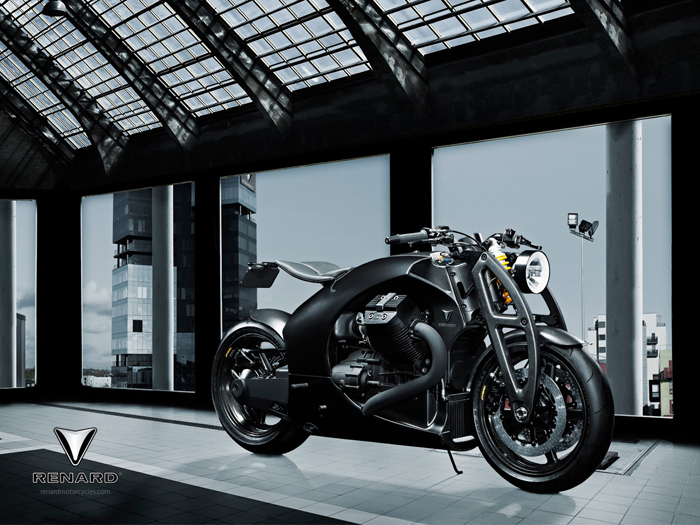 Lauri: What was the biggest challenge in designing and building this motorcycle? Andres Uibomäe: To maintain the desired production and sale price. Even if you make an exclusive product, such as a carbon fiber monocoque motorcycle, you have to remain within a reasonable price range. The biggest challenge was to achieve the desired price level without having to compromise the quality. Lauri: What is the future of Renard? How many units do you plan to manufacture? Andres Uibomäe: Our hope is to make 50 units per year over five years. If we manage to achieve this, based on one GT model, then we will be very, very satisfied. In five years’ time, we want the Renard brand to be known within its market segment, and to be in a position where customers trust us based on the quality of our products and how they endure over time. Lauri: Where will Renard be positioned in the world? 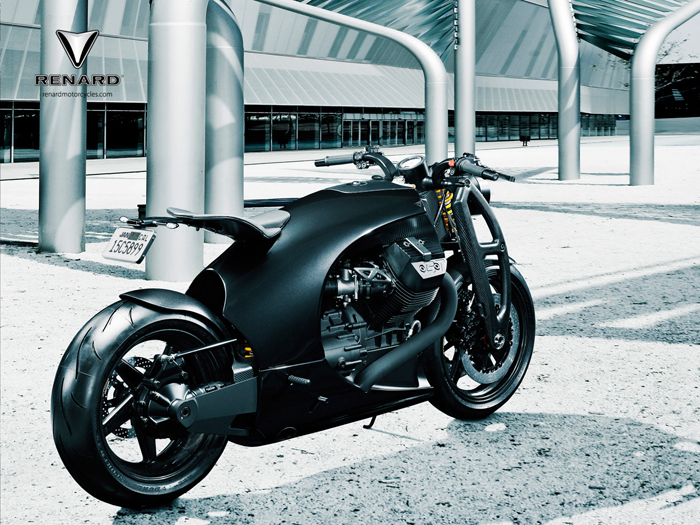 Andres Uibomäe: The Renard GT is positioned in a small production series, high-priced motorcycle class. At the moment we are acquiring a small series VIN code, which will be issued to manufacturers that make up to 200 units per year. So it is exclusive enough if we look at the production capacity, and ultra-exclusive if you look at the country it comes from. Our competitors are chopper builders, but in particular we want to share market with Vyrus, Confederate, NCR and Wakan. At a price which is estimated to be close to $100,000, this will definitely be in the very ‘exclusive’ class. If you want to find out more about the Renard GT, head over to their website at www.renardmotorcycles.com.